Avoid wasted trips to your imaging core facility. Pre-screen your sample preps for fluorescence. Rabbit psoas muscle fibers stained with Alexa Fluor 488 Phalloidin, in white light and fluorescence. Images made with Motic SMZ-186 microscope using NIGHTSEA's white LED (left) and the Royal Blue excitation/emission light+filter set. Samples courtesy of Dr. Beth Brainerd and Natividad Chen, Brown University. Are you frustrated booking time on a confocal, twophoton, or high resolution fluorescence microscope at your imaging core facility, only to find that your sample preparation does not fluoresce? With NIGHTSEA's Stereo Microscope Fluorescence Adapter you can save time and money by using the routine stereo microscopes you already own to prescreen your samples for successful introduction of fluorescence before you book time at the imaging core. Fluorescence is a powerful and widely used tool for a variety of studies in cell biology, neuroscience, and other fields. The latest imaging tools provide remarkable specificity, resolution and tissue penetration. These benefits come with costs both in hourly fees and access limitations. The high end compound or stereoscopic fluorescence microscopes, confocal microscopes, and 2-photon imaging systems needed for high resolution fluorescence imaging are almost always a limited resource located in centralized microscopy core facilities and shared on a sign-up basis. Hourly use fees are generally in the $20 - $60 range, depending on the microscope. The process of introducing a fluorophore into a specimen is not always successful. This can lead to frustration and unnecessary cost when you schedule time on a microscope and bring your sample to the core facility, only to find that there is no fluorescence to image. The NIGHTSEA Stereo Microscope Fluorescence Adapter enables you to pre-screen your specimens on a standard stereo microscope. The detail is not important - the presence/absence and general location of fluorescence lets you know whether it is worth taking your specimen to the imaging core. Between the direct expense of the use fee and the time wasted to look at a non-fluorescent specimen it will not take many saved trips for the NIGHTSEA system to more than pay for itself. 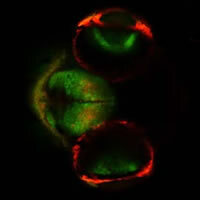 Confocal image of brain of transgenic zebrafish (Dania rerio). Kaede protein – green is unconverted, red is photoconverted. Image courtesy of Robert Thorn, Creton Lab, Brown University.